A few articles covering this are focusing on trading in Gold. We singled out gold because it was one of the few instruments with high activity in the minutes before the 2pm announcement. This high activity preceeding the release allowed us to verify that the exchange time stamps we used later, were accurate. It wasn't just gold. It was everything that traded. In fact, the 1/100th of a second after 2pm was the most active 10 milliseconds in the history of the U.S. Stock an Futures markets. See charts at the bottom and also here. Within a millisecond of the 2pm release of the September 18, 2013 FOMC Meeting Announcement, the stock market exploded, trading nearly $400 Million worth of stock in a tenth of a second (a blink of an eye is 3 times longer), and almost $1 Billion worth in 2 seconds. Over in Chicago, futures trading also exploded, with about $5 Billion trading in a tenth of a second and more than $10 Billion in 2 seconds. The speed of this reaction stood out in stark contrast to previous FOMC (Federal Open Market Committee) releases. To get a sense of how unusual the September 18 reaction was, we pulled data from the two previous FOMC releases (June 19, 2013, and July 31, 2013) for comparison. It's hard finding superlatives to describe just how unique September 18 was. Incontrovertible: FOMC News was in Chicago and New York Trading Centers before 2pm. 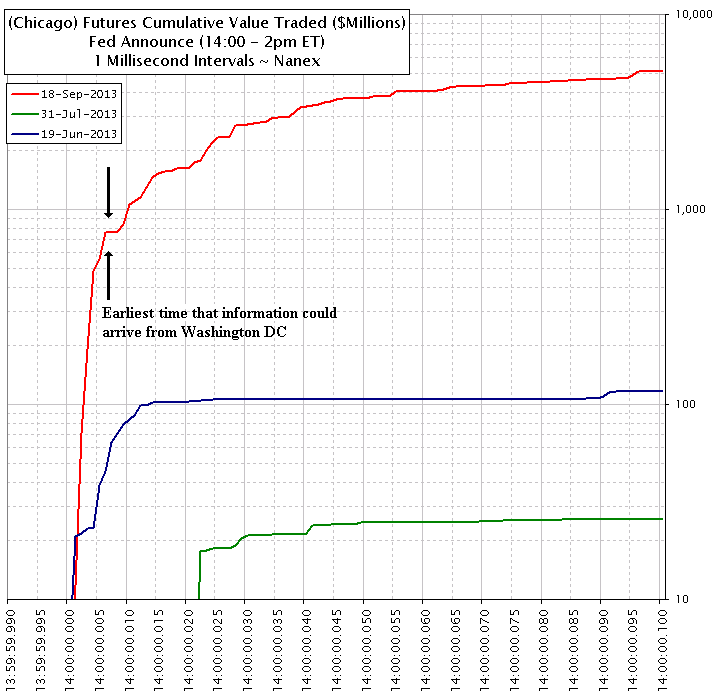 Nearly $800 Million worth of futures contracts traded in Chicago about 7 milliseconds before the official release time of the FOMC News (when it is 2pm in Washington DC). That's because it takes 7 milliseconds for information to travel from Washington (where news is released) to Chicago, mostly due to the speed of light. Pease read Einstein and The Great Fed Robbery where we present incontrovertible evidence that FOMC news had to be present in Chicago and New York trading centers before 2pm. This surprise revelation leads to many questions such as: how many computers had access to this information? Who had access to those computers? Why is the information allowed to be transmitted outside of the Fed lock-up room? Who else is allowed to do this? Can anyone start a news service and compete? How much are the news services paying? How much are they charging? Why was this not clearly disclosed? Why have a lock up room at all? When one group of traders has information that others don't, it creates what is known as information asymmetry. A recent, well known case of information asymmetry involved the 2 second early release of the Michigan Consumer Sentiment data to an elite group of high frequency traders. We noticed over the years, that significant market moving events occurred at exactly 9:54:58 on certain days. We found few people knew what was causing the market to move at these times. Getting early access to news is much more profitable, if done in secret. When the May 17, 2013 Consumer Sentiment news impacted the market 25 milliseconds earlier than expected, we wrote a paper about it which got noticed by CNBC. After CNBC reported on the 2 second advantage, the practice became widely known and ever since, there has been no significant market impact from Consumer Sentiment at 9:54:58. Which confirms what we have suspected for a long time: that getting early access to news is much more profitable, if done in secret. It is interesting to note that in the minutes before 9:54:58, uncertainty still creeps into the market causing a significant drop in liquidity. Which brings us to the market reaction to the FOMC news on September 18, 2013, which came earlier than physically possible due to the speed of light, and was therefore unexpected by many market participants. The end result will be an increase in uncertainty, which will lead to an even larger decrease in liquidity during the next FOMC announcement. Hopefully, the market won't need the extra support. 1. Compare Futures Trading in Chicago with Stock Trading in New York in the first 100 milliseconds. 2. 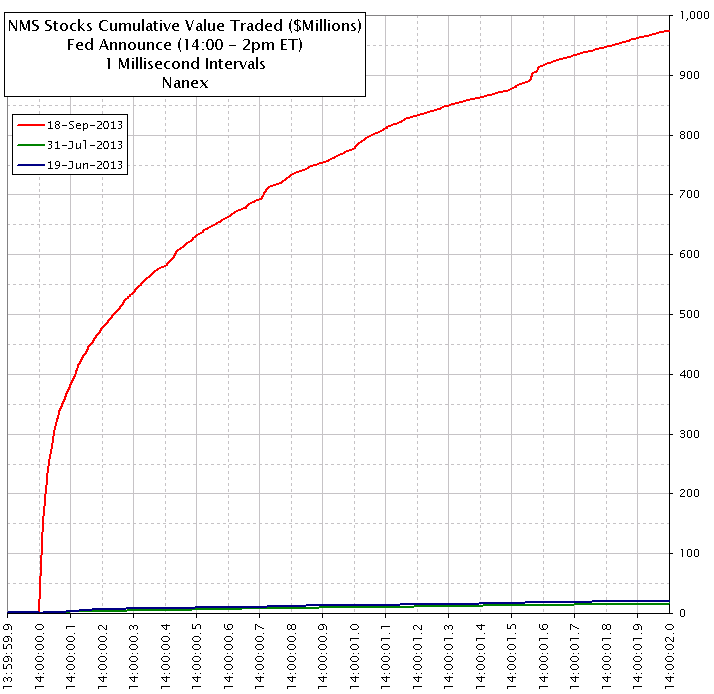 Compare trading in NMS Stock during 3 FOMC News Releases.